Sometimes I think Copyblogger's Brian Clark installed trojan horse in my computer a few years ago when I joined the Authority community. Or maybe he's just a mind-reader. Of course, it might simply be a coincidence that has something to do with the fact that we're both non-practicing lawyers of similar age who discovered the internet in the early 90s, way before most of our generation, and we both escaped from the drudgery of law practice. We also seem to have a similar taste in music. And, just in case you're curious, this isn't a rant and it's not intended to be mean-spirited. I feel a sense of validation, knowing that the brilliant Brian Clark comes up with many of the same ideas as I do—and succeeds at implementation. And since this blog is where I tell my story of my own hero's journey, I thought I'd share this mini-epic—if only to serve as a reminder to myself that I am a hero who's generating the same ideas as early as those who are the masters of the internet universe. Of course, I would also like to be one of the unemployable at Rainmaker Digital. I think I would make a great podcaster for their team. In any event, Brian is the “successful” one, at least in terms of business and finance. And I'm a Brian Clark/Copyblogger fan-girl. Disclosure: I use Genesis framework on many of my websites (not this one) and I've been in the Authority community since 2013 and have paid for the Rainmaker platform since the beta days of July 2014. 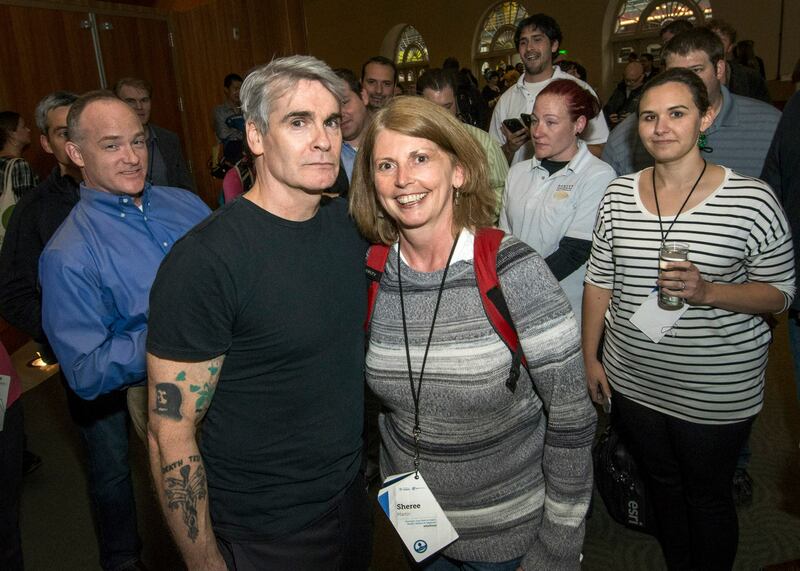 And I got to say hello to Henry Rollins at the 2015 Rainmaker Authority Conference. None of the links in this post are affiliate links. 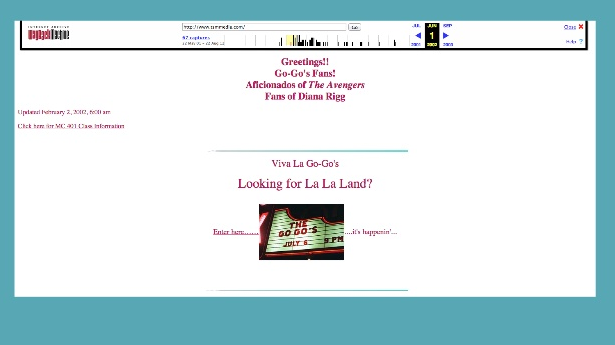 While I was busy making fan videos to accompany Go-Go's music and uploading those to my hand-coded website, where I blogged about the Go-Go's and TV's The Avengers, Brian was busy figuring out how to harness the power of the internet to build his first internet media empire. While I was stalled as a freelance writer doing long-form copywriting for ad agencies and working as freelance online editor for a couple of manufacturing trade sites, Brian was building his own online business portals. In 2000, I could see the future and I wanted to be part of it, but I knew that my HTML coding skills weren't going to take me where I needed to go and I didn't have the capital to hire developers. Like Brian Clark, I was reading Wired, Fast Company, and The Industry Standard. I saw the future, I understood it. I'd been building “online” relationships since 1990. That's why I'd eagerly embraced the opportunity to do online content editing for Manufacturing Equipment News and Fabricating Equipment News. I understood Free Agent Nation and the Brand Called You but I didn't have the tech chops to code or the financial resources to hire a developer. In any event, I'd long since exhausted my 401k from law practice days trying to make it as a writer. Before WordPress arrived in 2003 to make my life easier, the dot com bubble burst and my freelance writing work largely dried up by the middle of 2002. So I gave up and finished my Ph.D.
On the plus side, I bought my first iPod in 2001 and was listening to podcasts from the beginning. If I've learned one thing over the past 3 years is that I apparently have VERY good instincts for what's coming next. I've seen it in my own experience and, well, that's what Sally Hogshead has told me. But the reality is this: I'm not the best implementer of my own ideas, in part because I'm too much of a DIYer. My DIY mindset is driven by a combination of necessity, learned resilience from certain challenges of my childhood, and an innate desire to understand the how and why of pretty much everything. The reality is that hiring others, or simply outsourcing simple projects, requires disposable cash. I outsource what I can, but mostly I DIY. Like I said, I'm still paying for that Ph.D.
Like I said, silly me. But I digress…..back to Brian Clark and my instincts…. In late March of this year, I happened to be scrolling through my Twitter feed before calling it a night. Something prompted me to click on a tweet from Brian Clark…. I had not, at that point, heard of Brian's Further.net project, even though I was receiving a variety of emails from Copyblogger, Rainmaker and Authority. I'll confess to not reading many of the Copyblogger/Rainmaker emails in February and March–I was teaching 4 courses, had 3 preps, and was actually working on the Shinecast project. Despite my lackluster open rate at times, I highly recommend Copyblogger, er, Rainmaker Digital resources. Anyway, I clicked and discovered that Brian's Further.net site is about personal development centered around the themes of Health, Wealth and Wisdom. See The Ben Franklin Follies. At another point in my life, I might have been deflated. Instead, it made me feel good about my vision, however poorly I've implemented it. @brianclark looks like we have a common interest in health, wealth and wisdom. http://t.co/B6eyCHYSp2 ???? I thought about writing this blog post that evening but, like I said, I was busy with my last semester of teaching. 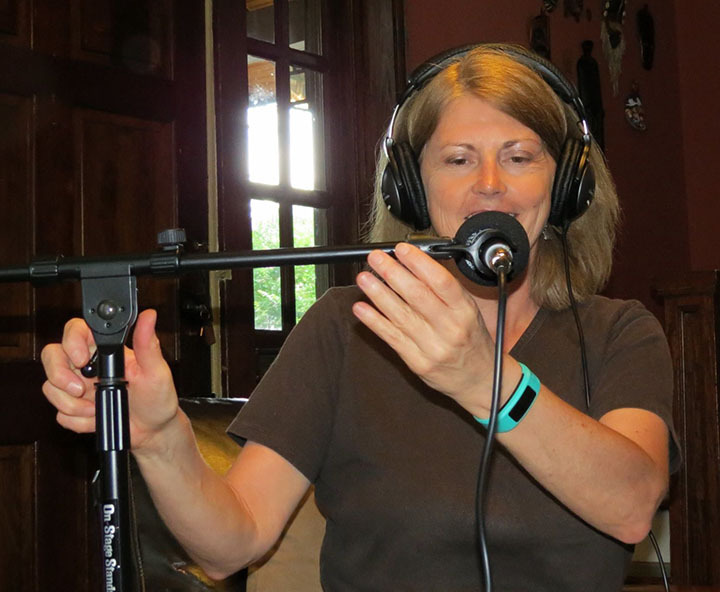 I was also in the midst of starting a new podcast, Birmingham Shines, which I planned to use as a promotional vehicle for my rollout of the expanded Shinecast® media empire. Instead of writing a blog post about “great minds” or mind-melding, I filed the idea away in my head to write someday, or not. A few days later, in early April 2015, I wrote my About page for the Shinecast.tv website. Each of us is a hero. Our life is a journey. On the path, we encounter the people, places and things we are given to teach us the lessons we need to move farther along the journey. The mission of Shinecast® is to help you on this journey. We can’t be the true hero of our own life unless we grow into the person we were meant to be. Shinecast is where you find stories, inspiration and the tools to help you Discover, Grow, and Shine in all areas of your life. The Shinecast vision is about living a whole, real and authentic life in the 21st century. The Shinecast lifestyle is about achieving health, wealth, wisdom and happiness. Although I published the About page on April 6, and made a few copyediting revisions since then, mainly to break up the paragraphs into shorter phrases, the essence of my message has been in development since late 2012. You can see bits and pieces of it on my About page for The Ben Franklin Follies and here on my Shinecast Vision and Values page and in many posts on both websites. The idea to use the hero's journey as my own metaphor came mainly through my use of the hero's journey as the framework for a freshman Communication Arts course I taught in Fall 2014. I wanted to find a way to help students move beyond traditional academic essay writing and focus on storytelling. The story behind this photo? 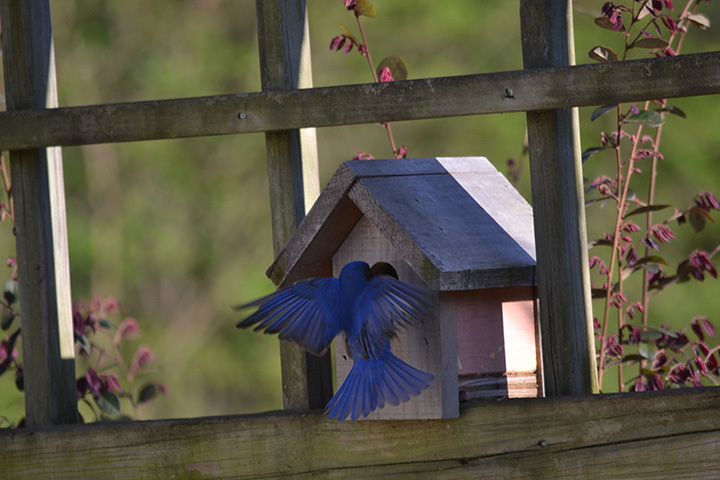 While doing yard work, a cacophony of chattering and screaming birds (of all stripes), prompted me to look up to see a snake slithering into this bird house, where the blue bird's nestlings were housed. I managed to grab my camera and capture a series of photos of the unsuccessful hero bird. Each of us is a hero and we're on a hero's journey and we need to face our obstacles, fight our battles, and be transformed. Aside from learning to tell better stories, I wanted the students to feel empowered as they began their college experience, rather than being stuck in a box that someone else created for them. In the first class session, I scattered a bunch of boxes on the floor and asked the students to write a few paragraphs about what these boxes represented to them. It was my way of getting acquainted. I don't like feeling boxed in. I believe in the power of the hero's journey, so I decided to use it as the framework for all of the content I planned to create and publish under the Shinecast® brand. The Shinecast mission is premised on the idea that life is a journey, we're on a path, and my Shinecast resources are intended to help shed some light along the way. So I suppose I shouldn't have been surprised a few days ago to hear Brian Clark talking about each of us being on a hero's journey in his Unemployable podcast conversation with Kathleen Shannon. That episode is about what makes a brand (hint: it's not the logo) and the importance of authenticity in finding your brand identity. So anyway, that coincidence was, as they say, the last straw. I had to chime in with this blog post and my own hero's journey to this place I'm at in mid-September, 2015. Even though this version is highly abbreviated, this blog post is long enough, as it is….Keep in mind that I'm a lawyer. We like words. 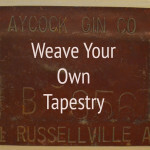 Perhaps I'll use this blog post in my memoirs some day. By late Spring 2012, I knew I was going to leave my academic position sooner than later. 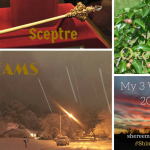 I had have big, long-term plans for building my Shine Springs Farm and Apiary, so I started looking for ways to transform my blog, The Ben Franklin Follies, into something more than a variety show of content, where I let my curiosity determine what I'd write about or, occasionally, curate. (a) My love for audio content was stronger than ever. I'd majored in broadcasting in college, with an emphasis on radio, and had worked as a college radio DJ and weekend board operator for my university's big NPR-affiliate station. (b) Podcasting was only going to get bigger and I wanted to have a whole stable of shows. (c) The Shinecast was a cool name for a podcast and could be a key part of my branding. The Shine Springs Farm Shinecast developed a small, but seemingly loyal, following. Thanks to Copyblogger, I knew by that point that teaching and online courses were going to be huge, so I registered the domain, Teach Social Business, and put together a website where I would document how I was teaching a college-level social media/content marketing course I'd developed. I intended to create some type of course to sell to other college professors who needed to teach a course in social media yet didn't fully understanding social media and content marketing. I started posting to the Teach Social Business site and decided to take a few courses myself, to get a feel for how these online courses worked. It's still there, although it doesn't look very pretty right now. As it happened, my 50th birthday was coming up in November of 2012 and I'd been on a self-reflection and journaling binge through the Fall of 2012, trying to figure out how to transition out of my academic position into something entrepreneurial that would also support me at my current standard of living. Chris Brogan happened to announce the launch of his Brave New Year course during the week of my birthday, which always falls around Thanksgiving. I signed up. Over the next 60 days, I worked through Chris's course and was fairly active in the Brave Facebook group and Google+ community. I also did a couple of other small online courses and joined Corbett Barr's Fizzle program for about 6 months, just as it came out of the beta test. One mistake I think I made in those months from December 2012 – February 2013 was to listen too much to the feedback I got when I posed questions to community members. He may have meant this in the context of doing audience research, but I felt somewhat chastened. After all, it was Chris Brogan asking the question, not Joe Schmo. Not long after that, Chris launched his own course, Social Media Mastery. I'm not sure if it had that exact name, originally, but that or a similar course came along not long after I put my idea on the table. That was the first clue that my ideas had validity, even if I wasn't quite ready for prime-time. I've always loved my idea for The Ben Franklin Follies, even though I've never expressed it well or executed it well. Because I'm so in love with it, I've also always been reluctant to let it go and move on. I still don't know whether I should let it languish or revive The Ben Franklin Follies and I'm still trying to decide. I know all the psychology about sunk-costs and all that. But hey, Pal Joey gets a revival every now and then and The Ed Sullivan Show was huge (in its day). Some of the blog posts get decent traffic (by my measure), especially for a site that's updated sporadically and is all over the map in terms of content. The Ben Franklin Follies truly is a smörgåsbord, especially if you go deep into the archives. In February 2013, I sat down and wrote the basic outline for how I could transform The Ben Franklin Follies into something bigger and better and more focused. So I wrote my own Happy Life Manifesto about the path to a happy life. When I set out to look for domains (such as the happy life project), I discovered someone named Gretchin Rubin had written a book called the Happiness Project. I'd never even heard of it. Not wanting to be influenced by her thinking, I avoided even looking at her website. I know she's successful. Props. I look forward to reading it someday soon. 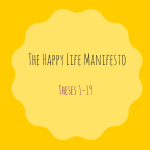 I had still have plans to publish The Happy Life Manifesto as a book of short essays. 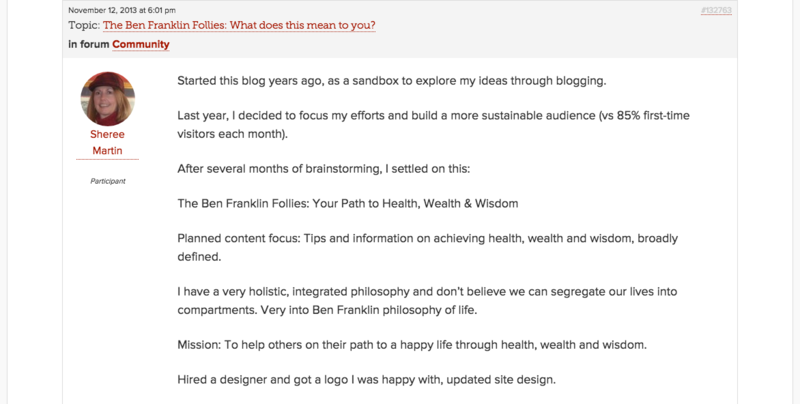 After a great deal of back-and-forth, I ultimately revamped the Ben Franklin Follies blog around the theme of helping my audience on the path to health, wealth and wisdom. By the end of March 2013, I had a website re-design completed and seemed ready to move forward. Not sure if it was fear, or just too much on my plate. I got my first two colonies of honeybees in May 2013 and spent massive hours each week from late May through August doing my Shine Springs Farm thing. I loved every minute of it. In August 2013, as I turned my attention from farming back to teaching, I also turned my attention back to developing my online media empire. I joined Copyblogger's Authority program and signed up for the first Authority event as soon as registration opened. I managed to keep my blogging alive, but I continued to languish, seeking advice and letting the short-sightedness of others poke holes in my balloon. I got a couple of bits of meaningful feedback from and one naysayer who apparently didn't ready the part where I wrote that the existing content was all over the place and that I would be more focused in the future. Of course, I let the naysayer's admonishment hold sway, at least for a while. In the 20 or so months since my post to the Authority forum, I've continued to push forward, sometimes 2 feet forward, 23.9 inches back, but I'm making progress. I've written an ebook on real food that's essentially ready for sale–just needs a final proof-reading (and a better cover). 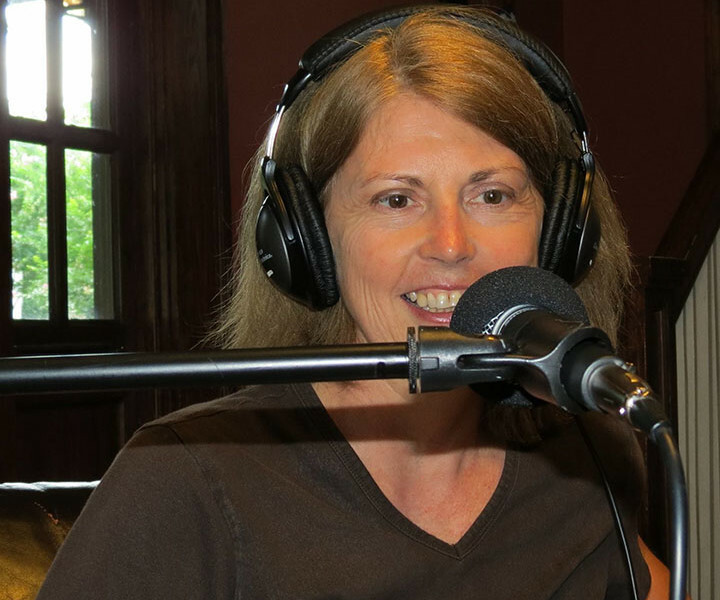 In January 2015, I published this guest post on See Jane Write about finding your true north, living authentically, and the Shinecast® mission. I may be slow out of the gate and slow to execute, but the beauty of the internet is that it's a big playground. I still believe that I'll succeed and that my plans to offer valuable resources to help others on their path to health, wealth, wisdom and a happy life. After all, we're heroes, even if Billy's fiancé didn't want him to be one. For what it's worth, I prefer the DeFrancos, the Partridge Family, and the Osmonds (Crazy Horses, y'all).